Cluster of a possible Myopsocus, photographed by Steve and Alison. Contains: Cerastipsocinae, Psocinae, Amphigerontiinae, Lichenomiminae. The Psocetae is a clade of bark or stone surface dwelling barklice that lack setae on the fore and hind wings (Yoshizawa 2002). Characters (from Yoshizawa 2002): Medium to large in size, about 3–10 mm. Coloration variable, but usually whitish in ground colour and with dark brown markings. All bark or stone surface dwellers. Head with rounded vertex; postclypeus not strongly bulged; internal ridge of epistomal suture narrow; anteclypeus sclerotized; male eyes usually much larger than female’s; ocelli complete, not clustered on small tubercle; mandible short, outer margin smoothly rounded, posterolateral margin not hollowed; lacinial tip variable; galea flattened; labial palpus rounded. Prothorax less bulged dorsally. Pterothorax greatly bulged dorsally; median part of mesoscutellum pentagonal; mesothorax with narrow precoxal bridge and broad trochantin; membranous region of metaepisternum broad. Forewing often with dark brown markings; posteroproximal corner smoothly rounded; veins and wing margin glabrous; top of CuA1 usually connected with M except free in Psilopsocidae; A2 never present. Hindwing glabrous, posteroproximal corner smoothly rounded; Sc clear; Rs and M + Cu fused for long distance basally; Rs and M fused or connected by crossvein (some genera in Myopsocidae). Hind tarsus with row of broad ctenidia based setae (condition of this character in Psilopsocidae not examined or documented); tarsi 2- or 3-segmented; claws with preapical tooth; pulvillus broad or narrow (Psocidae). Abdomen without eversible vesicles ventrally. Male genitalia: paraproct with process on distal margin. Hypandrium usually with complex distal processes or lobes. Phallosome variable; internal valve present or absent; external valve often absent; endophallus lacking sclerotized portion. Female genitalia: paraproct with cylindrical distal projection. Subgenital plate with 1-lobed egg guide extending from ventral margin; apex of egg guide usually bearing setae. Gonapophyses complete and variable in structure; external valve internally expanded. [B55] Badonnel, A. 1955. Psocoptères de l'Angola. Diamang Publicações Culturais 26: 11-267. [GTM12] Gunawardene, N. R., C. K. Taylor & J. D. Majer. 2012. Revisiting the Psocoptera (Insecta) of Barrow Island, Western Australia. Australian Entomologist 39 (4): 253-260. [L02] Li F. 2002. Psocoptera of China vol. 2. Science Press: Beijing. [M74] Mockford, E. L. 1974. 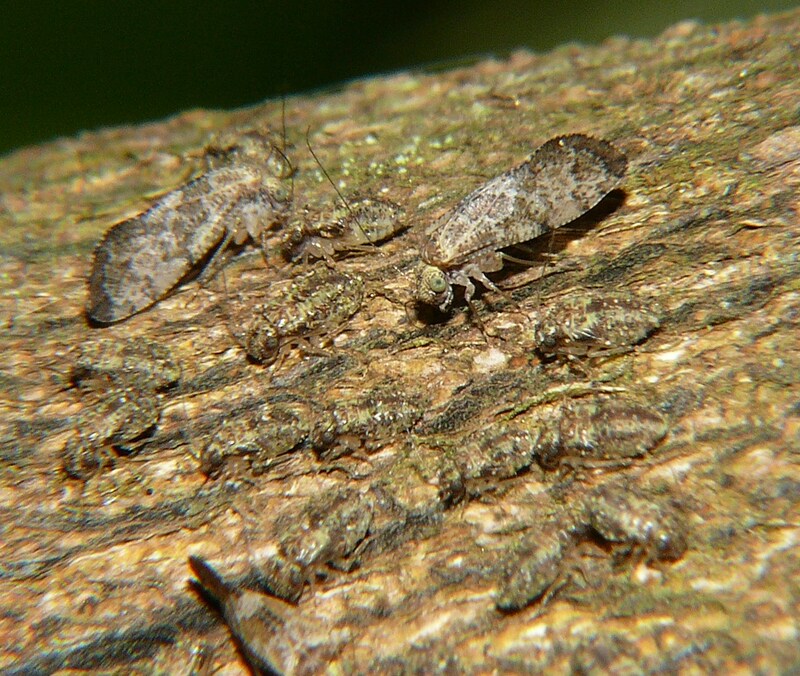 Records and descriptions of Cuban Psocoptera. Entomologica Americana 48 (2): 103-215. [M93] Mockford, E. L. 1993. North American Psocoptera (Insecta). Sandhill Crane Press, Inc.
[S95] Smithers, C. N. 1995. Psocoptera (Insecta) of Christmas Island. Invertebrate Taxonomy 9: 529-561. [Y02] Yoshizawa, K. 2002. Phylogeny and higher classification of suborder Psocomorpha (Insecta: Psocodea: ‘Psocoptera’). Zoological Journal of the Linnean Society 136: 371-400.